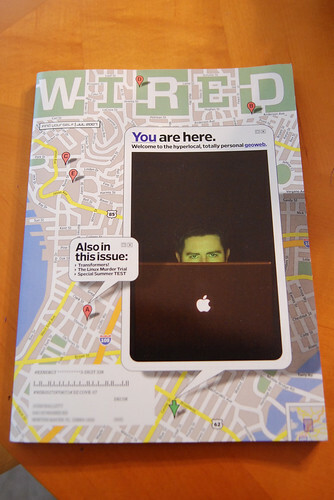 A few months ago Wired Magazine announced a special cover program with Xerox. If you were one of the first 5000 subscribers to send in your photo, it would be featured on a personalized cover. The idea was designed to show off Xerox’s custom printing systems. I was one of the luck 5000. A few weeks ago I received my personalized issue. I’m just now getting around to posting a photo of it. The cover is a standard glossy-photo stock. As you can see the ‘custom’ photo is included in a Google Map balloon. The standard issue featured Optimus Prime on the cover. Aw, I wish I would’ve done that now. I’m not much of a Transformers fan (though the Designers Republic layout was pretty nice). This is fabulous! Congrats! A prime example of personalized media.